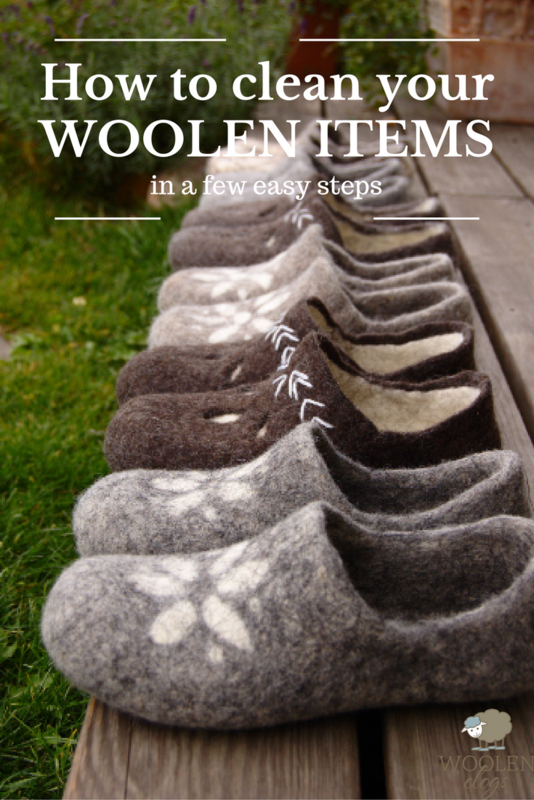 Chances are you have at least one woolen item of clothing or footwear at home. I remember one autumn, when first cold hit I was so excited to wear my favourite wool beret, but alas -- it was riddled with holes and suitable only for a scarecrow. It had been found by moths... I forgot to properly store it in the spring and the result made me so sad. Do you know what is the best way to make sure you will still be able to wear your wool garments when colder weather comes?Here's 5 quick tips on how to achieve that. So what is hygge in the first place? Hygge is a design and lifestyle concept from Denmark which is becoming increasingly popular. Associated with pale neutral colour schemes, especially white, Hygge homes focus on happiness and well-being. "It’s a special atmosphere of a special moment. It’s where everything just falls into place. Where the company is right, where the temperature is right, where we feel comforted, safe, warm and happy." There’s no need to invest in expensive décor, small changes to your home and your lifestyle is all that’s needed to give your home a little more hygge while also staying nature friendly. First tip - chose your materials! Pay attention to what your household items are made off. All the natural materials like ceramics, wood, linen, wool will help to create a more natural nurturing home and will be healthier than the alternatives. 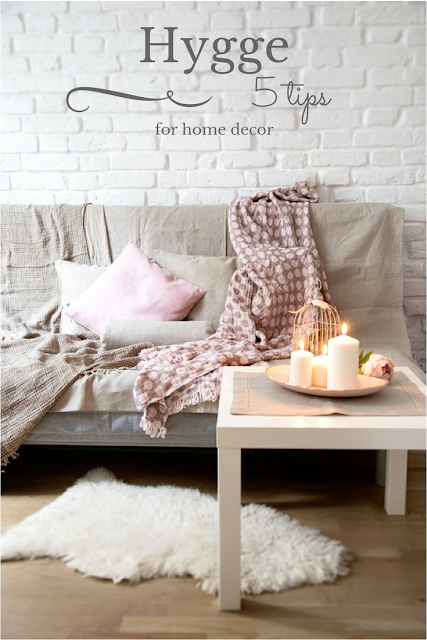 Linen tablecloths, pillows, even blankets will bring warmth and coziness to your home. are used for different purposes, it does not require any pesticides, grows in unfertilised soil that other cultures would not thrive in. If you are looking for high quality natural materials for your home -- Etsy has a great deal to offer here. There are a lot of great shops that sell handmade items from natural materials -- a few of them that I tried myself are CozyLinen (for all your table linen needs and more - great aprons, towels, napkins and tablecloths and all from 100% linen and handmade with care), Pillowlink (pillows of all shapes and forms, great design and high quality linen). 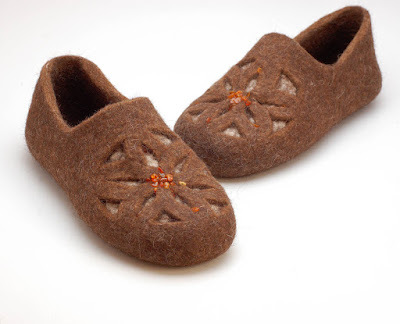 You can find 100% eco wool legwarmers and shoes in Woolenclogs shop. For all your ceramic needs you can try MissDishCeramics. Yes, wool shrinks when agitated with a detergent in changing temperature. Washing it even with all the newfangled detergents that are made for wool can be a hit or miss affair. Here's a few things that might help you to put that washing day further and when it comes -- to get the best result. Read on! Wet felting is one of several methods which can produce felt from wool and other animal fibres. Warm soapy water is applied to layers of animal hairs. Repeated agitation and compression causes the fibres to hook together into a single piece of fabric. Wrapping the properly arranged fibre in a sturdy, textured material, such as a bamboo mat or bubble wrap, will speed up the felting process. After the wet felting process is complete, the felted material may be finished by fulling. Only certain types of fibre can be wet felted successfully. Most types of fleece, such as those taken from the alpaca or the Merino sheep, can be put through the wet felting process. One may also use mohair (goat), angora (rabbit), or even certain dog hair. These types of fibre are covered in tiny scales, similar to the scales found on a strand of human hair. Wetting and soaping the fiber causes the scales to open, while agitating them causes them to latch onto each other, creating felt. Plant fibres and synthetic fibres will not wet felt. A subset of wet felting is nuno felting. It is a technique developed by Polly Stirling - a fibre artist from Australia. The technique bonds loose fibres, usually wool, into a sheer fabric such as silk gauze, creating a lightweight felt. 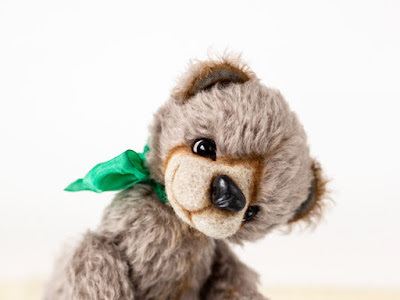 Needle felting is a popular fibre arts craft that creates felt without the use of water. Special needles that are used in industrial felting machines are used by the artist as a sculpting tool. While erroneously referred to as "barbed" needles, they in fact have notches along the shaft of the needle that grab the top layer of fibres and tangle them with the inner layers of fibres as the needle enters the wool. Since these notches face down towards the tip of the needle, they do not pull the fibres out as the needle exits the wool, unless a reverse needle is used (with this desired effect). Once tangled and compressed using the needle, the felt can be strong and used for creating jewellery or sculpture. 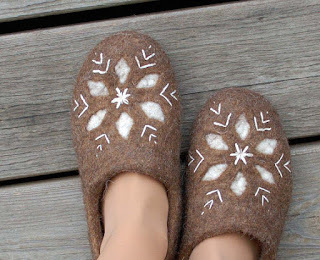 Finer details can be achieved with this method using a hand-held tool with either a single needle or a small group of needles (2-7), so it is a popular technique for producing 2D and 3D felted work. Certain artificial as well as natural fibers can be needle felted. Most of the machine needle felt is synthetic. 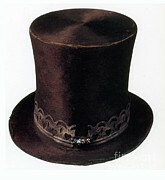 From the mid-17th to the mid-20th centuries, a process called "carroting" was used in the manufacture of good quality felt for making men's hats. Beaver, rabbit or hare skins were treated with a dilute solution of the mercury compound mercuric nitrate. The skins were dried in an oven where the thin fur at the sides turned orange, the colour of carrots. Pelts were stretched over a bar in a cutting machine, and the skin was sliced off in thin shreds, with the fleece coming away entirely. The fur was blown onto a cone-shaped colander and then treated with hot water to consolidate it. The cone then peeled off and passed through wet rollers to cause the fur to felt. These 'hoods' were then dyed and blocked to make hats. The toxic solutions in the dye and the vapours it produced resulted in widespread cases of mercury poisoning among hatters, which may have been the origin behind the phrase "mad as a hatter". I love wool -- it is warm in the winter an cool in the summer, it wicks away moisture and best of all -- it is natural! Of course this latter is only true if it is not dyed and not washed in sulphuric acid as it is mostly done in quite a few Australian, New Zealand and USA wool washing facilities. What gives wool it's wonderful properties? So much in such a small thing! Let's go over some of the characteristics. FELTS NATURALLY The physical structure of the outer scaly layer of the wool fiber contributes to wool’s unique property of felting. Under the mechanical action of agitation, friction and pressure in the presence of heat and moisture, the scales on the edges of the wool fibers interlock, preventing the fiber from returning to its original position. Felting shrinkage is irreversible. Felting is also an advantage because it provides for a wide variety of non-woven felt fabrics and handmade felt articles. This is why wool is so strong and resilient when felted -- the thick mesh of wool fibers forms a strong and shape retaining mat, that will not tear, will not deform and can be reshaped if you make it wet. DURABILITY AND RESILIENCE Each wool fiber is a molecular coilspring making the fiber remarkably elastic. Nature has folded the chemical polypeptide chains back upon themselves in such a way that they act like a coiled spring which elongates when it is extended and retracts when it is released. This molecular crimp, along with the 3-dimensional fiber, allows wool fibers to be stretched up to 50% when wet and 30% when dry, and still bounce back to their original shape when stress is released. But be careful: When wool is wet the fibers are weaker. Recovery from stress takes place faster when the fiber is in a humid environment; that’s why steaming a wool garment will freshen the fabric and why a steam iron is recommended for pressing wool. The flexibility of the wool fiber also makes it more durable. A wool fiber can be bent back on itself more than 20,000 times without breaking, compared to about 3,000 times for cotton and 2,000 times for silk. The natural elasticity of wool also makes woolen fabrics resistant to tearing. In addition, the outer skin of the wool fiber acts as a protective film, giving wool cloth improved resistance to abrasion. 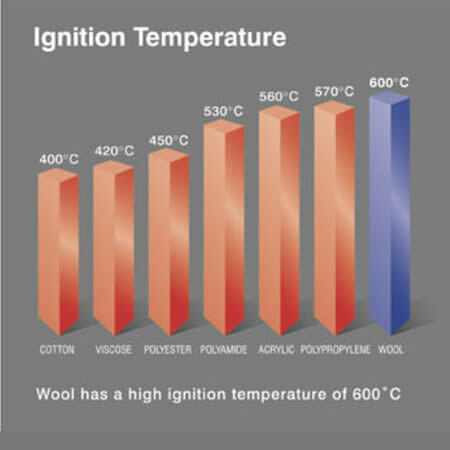 RESISTANCE TO FLAME Because wool contains moisture in each fiber, it resists flame without chemical treatment. Instead of burning freely when touched by flame, wool chars and stops burning when it is removed from the source of fire. Wool is self-extinguishing. Wool does not melt when burned, and so cannot stick to the skin and cause serious burns. 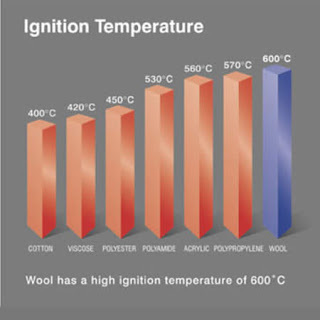 It will not support combustion; this is why wool blankets are recommended for use in extinguishing small fires. CHEMICAL STRUCTURE Wool is a natural protein fiber that grows from the follicles of the sheep’s skin. It is like human hair in that it is composed of keratin-type protein. Chemically these proteins contain 5 elements: carbon, hydrogen, oxygen, nitrogen and sulfur. These 5 elements are combined into 19 amino acids linked together in ladder-like polypeptide chains. 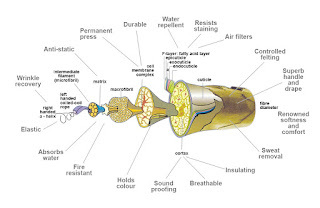 MOISTURE REGULATION/BACTERIA CONTROL Wool is a hygroscopic fiber; it takes up moisture in vapor form. Tiny pores in the epicuticle make the fiber semi-permeable, allowing vapor to pass through to the heart of the fiber. Wool can easily absorb up to 30% of its weight in moisture without feeling damp or clammy. The capacity to absorb makes wool a “temperature regulator” because it can protect the body in both cold and warm conditions. Wool always absorbs moisture from the atmosphere of greater humidity and releases it to the drier environment as it creates a balance in moisture conditions. Wool absorbs perspiration; thus it keeps a layer of dry air next to the skin which, in turn, helps to hold in body heat. Wool’s hollow fibre promotes air circulation and prevents bacterial growth. Bacteria can only grow in moisture; wool‘s natural fibre wicks moisture away from the skin preventing the conditions that allow bacteria to thrive. As wool absorbs atmospheric moisture, the hydrogen bond of water is broken and chemically reacts with molecules of the wool to generate heat. Wool garments are therefore regarded as good protection against hypothermia… a condition that occurs when sudden drastic lowering of body temperature causes the body to lose heat faster than it can be produced. The same principle of moisture contact on the skin acts to protect against hot weather as well. The body cools itself naturally with the evaporation of perspiration. Wool expedites this process by absorbing perspiration and keeping the same dry air next to the skin. This is why wool footwear is great for regulating temperature for your feet and making sure they do not sweat.